Between the death of Jose Fernandez, NFL football, and the fact that FS Ohio isn't airing the game, the game seems likely to be an afterthought. 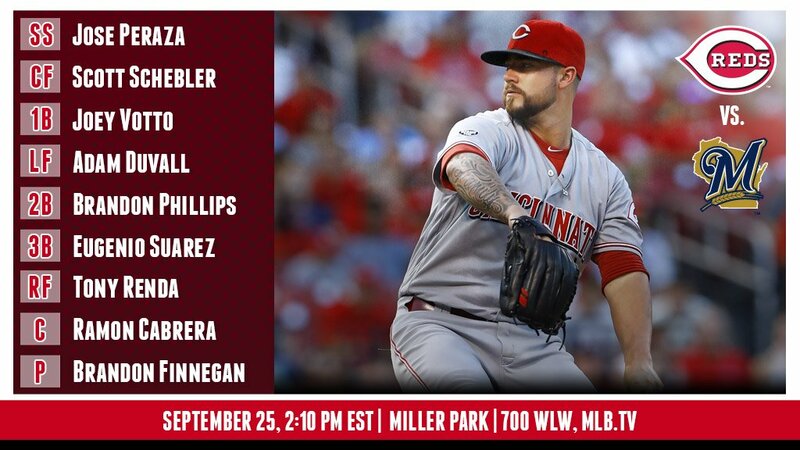 But it will still be played and Brandon Finnegan will be making his final start of the year. Schebler with a double, Brewers announcers complimentary of his swing. Votto walks and Duvall doubles off the wall to bring in Schebler. BP grounds one to short to bring in a run but Duvall out at 3rd on the fielder's choice. Eugenio K's to end the first. 2-0 Redlegs. Last edited by Tom Servo; 09-25-2016 at 02:23 PM. Braun with a two out triple, would have been a double but Renda doesn't know what he's doing in right field. Reds indifference to putting actual outfielders in the outfield is very much on my nerves. Finnegan takes a line drive off the leg for a single to start the second. That's not ideal. Two scoreless for Finny with no walks and two strikeouts. Last edited by Tom Servo; 09-25-2016 at 02:49 PM. I'm OK with Renda at 2B and LF. (I think he can also play SS and 3B, at least I think he played those spots in the minors.) But I don't see him as a RF. Peraza walks, advances to third on the catch throwing the ball down the line, and Schebler with another line drive hit, a single, to make it 3-0 Redlegs in the third. Scoreless third for Finnegan with two more K's. I'm actually liking the Brewers announcers, never much paid attention to them other than background noise on occasion but they are solid. Five scoreless by Finnegan on 54 pitches. Finnegan's day, and presumably season, done after five. Josh Smith comes in and gives up a single and a double. I'm going back to football during the bottom half of innings. Josh Smith was doing pretty good until last month or so. Just like Wood. What the heck happened. It's not like they were overworked. Brewers got two off of YUMBO in the bottom 7th. Votto with a double, his 30th, in the top of the 8th.